It's Lovely! I'll Take It! : Have you ever looked at the wallpaper? I mean, really looked at the wallpaper? Have you ever looked at the wallpaper? I mean, really looked at the wallpaper? I was thinking it was a good thing that there was a bed in there, because if you look at the paper too long, you'll collapse. Goodness! What a lot of people read this blog. Hi everybody! I can't even imagine a room where that wallpaper would look good. I'd like to hang out in the room long enough to twirl 20 times around and lay down and watch the world... cheaper than those hallucinogens right? Um...can I tell you I love that room? Seriously, that's cool. If only the rest of the house had that style and not the "we've retired and moved to Boca" look. 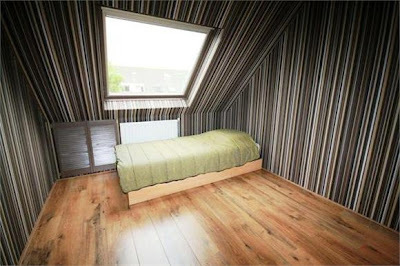 I can't believe they forgot to wallpaper the floor, at least they remembered the ceiling. I think a nice plaid paper or polka dots would go really well with those stripes. What about the little window thing in the lower left hand corner? Is that a portal of some kind, I wonder? This blog is my favorite thing ever. Probably not a good idea to dress the kids in striped jammies either. Could lose them by blending into the wallpaper. Don't worry about your Mom. She lived through the sixties. She's seen and done it all, no doubt. Wow that's a sweet room, I'd live there. About the listing...at least you know the previous owners didn't suffer from astigmatism. It's like a homemade horror movie, "Revenge of the Bar Coding Machine!" Oh! Oh! I love the room! But I hope that's the only place with that wallpaper. One corner, yes. Whole place, no! a big, "hello!" to sara's mom from across the pond. Good grief, that is awful! It's definitely enough to induce nausea or dizziness! Someone asked "What about the little window thing in the lower left hand corner? Is that a portal of some kind, I wonder?" Yes, Alice called and said the looking glass is on the other side of that portal thingy.